This is a picture of my husband and my purebred silver German Shepherd Riley. One of his parents was white and the other the normal brown and black. He was the unique one in the litter, that is why we picked him. He is a hyper puppy who is now 2 years old. He loves everyone and especially loves to play with other dogs that are smaller than him. He doesn't realize how big he is when he is playing with them. He's so cute. I love him so much. He loves going for walks and runs and absolutely loves riding in cars. 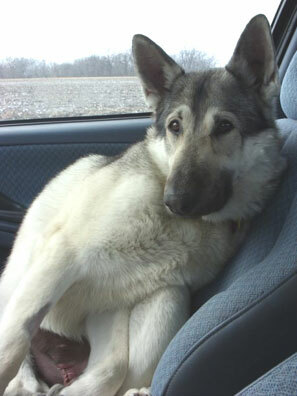 This picture was taken on our way home from college after I brought him to school with me for a week to get neutered. In a month he is going to get to go on a big car ride when him and I drive down to Texas to be with my husband who is in the Army. this is a beautiful dog. I can see why you would pick him.